A study by Lorei and Hersham found that tarsal tunnel syndrome was caused by repetitive ankle dorisflexion during running. Knowing this, heel strike runners may be at greater risk than forefoot runners in suffering from tarsal tunnel syndrome because ankle dorsiflexion is a significant portion of heel strike running mechanics. 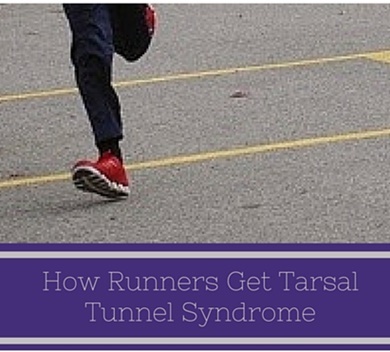 Tarsal tunnel syndrome is a repetitive strain injury that occurs when the posterior tibial nerve –a nerve innervating deep within the calf musculature, extending into the foot– becomes compressed (nerve entrapment). 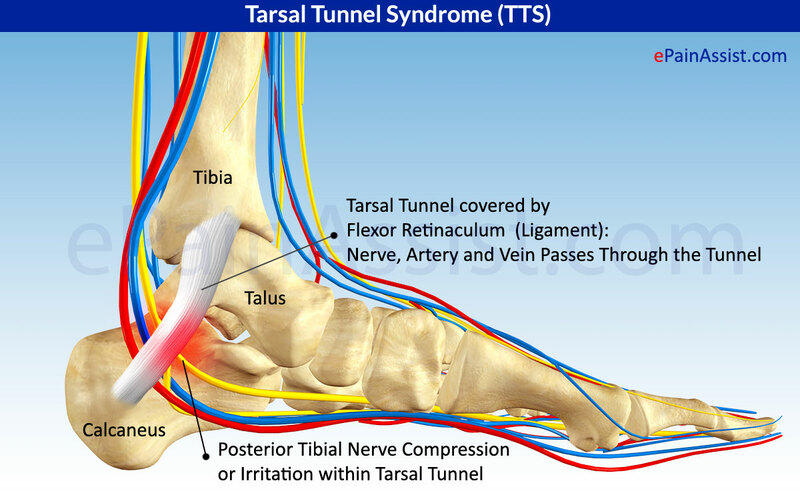 The tarsal tunnel is a fibrous tunnel that is not structurally flexible meaning there is limited room for swelling inside the tunnel, causing nerves to be easily entrapped. Heel striking is assisted by ankle dorsiflexion whereby the combination of landing on the heel while the ankle dorsiflexes increases compartment pressure to a level that increases arterial spasm, capillary obstruction, arteriovenous collapse, and venous outflow obstruction during running. Top left, a heel strike landing achieved only by ankle doriflexion at touchdown (forefoot lifts up to heel strike). Ankle dorsiflexion is generally influenced by cushioned heeled footwear, shown above right. Bottom left, a forefoot strike landing achieved by ankle plantarflexion (forefoot in neutral position) which like ankle dorsiflexion, is strongly influenced by footwear, or lack thereof. As a consequence, the posterior tibial nerve, which sends high-speed data from the plantar surface to the central nervous system, becomes entrapped when compartmental pressure thresholds are exceeded resulting in foot and ankle pain as well as numbness and motor delays. Did you know that cushioned heeled running shoes is the main reason why most runners heel strike? Find out more about the destructive side-effects of the conventional running shoe. Landing with a forefoot strike has been shown to be a more promising alternative to heel strike running because the characteristics of a forefoot strike landing enables runners to run with less compartmental pressures on the lower leg. 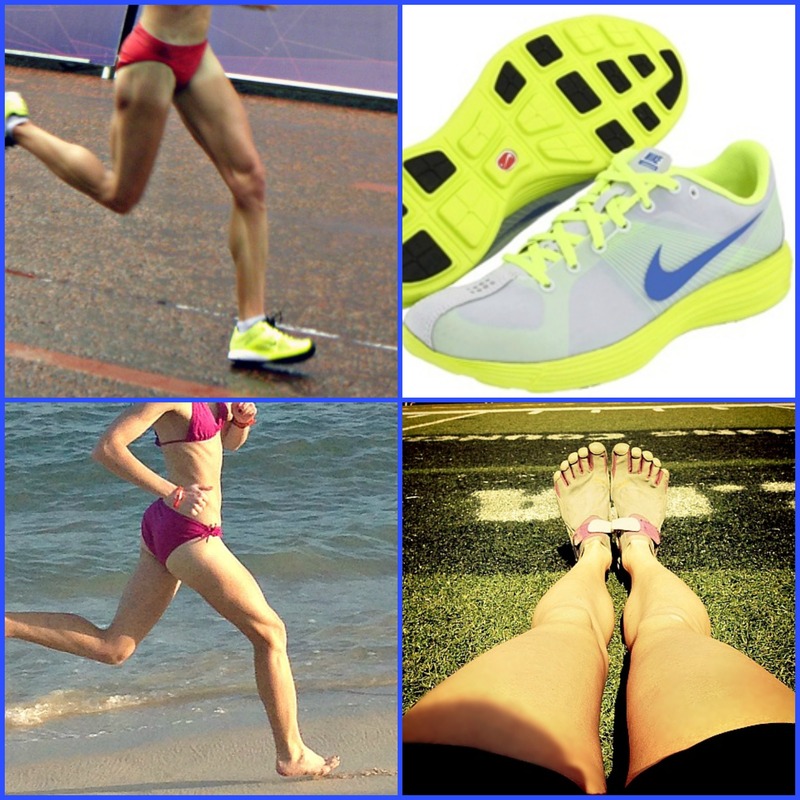 Click here to learn more about forefoot striking. Forefoot Running Benefits – Discover how forefoot running prevents injuries. The Worst Way to Run – Science shows why heel striking is the wrong way to run. Bad Running Shoes – Find out what type of running shoes force us to heel strike and cause pain. Best Shoes for Forefoot Running – Reflecting on the best, most highly reviewed barefoot-like running shoes for forefoot strikers. Aminoff MJ. Tibial and sural neuropathies. In : Electromyography in Clinical Practice. 3 rd Ed. Churchill Livingstone. P 479-492.1998. Colak et al. Comparison of nerve conduction velocities of lower extremities between runners and controls. J Sci Med Sport, 2005; 8(4):403-410. Jackson DL, Haglund B. Tarsal tunnel syndrome in athletes. Am J Sports Med 1991;19:61- 65. Lorei MP, Hershman EB. Peripheral nerve injuries in athletes.Treatment and prevention. Sports Med 1993; 16(2): 130-47. Murphy PC, Baxter DE. Nerve entrapment of the foot and ankle in runners. Clin Sports Med 1985;4(4):753-63. Novacheck TF. The biomechanics of running. Gait & Posture 1998;7(1):77-95.